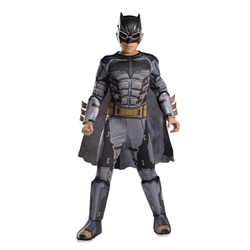 The Batman Tactical Kids Costume includes Padded Muscle Chest Jumpsuit with attached 3D Gauntlets and Boot Tops, Removable Cape, Belt, and Mask. This costume is available in Kids’ Sizes Small, Medium, or Large. Suit up to defend Gotham with the Batman Tactical Kids Costume! This iconic look will strike fear into the hearts of villains, and inspire the weak and the downtrodden. Check out our array of Batman accessories including Batarangs and Grappling Hooks to complete the look. Become the hero we need this Halloween!